Designing a new bathroom? Looking to renovate? Whether you’re building a new home or remodeling your existing bath, when you’re looking to create a bathroom with a real wow factor, consider adding a free-standing bathroom vanity. This kind of bathroom vanity mimics the look of standalone furniture but with the same storage and plumbing benefits of a traditional vanity. Set on its own legs, a free-standing vanity can also open a space by extending the room’s line of vision, with flooring continuing underneath the cabinetry. When you’re ready to install a new, free-standing bathroom vanity in your space, here’s a look at the benefits of this choice as well as how to do it right. Expanded sense of space. Especially in a small bathroom, a free-standing bathroom vanity can help enlarge the sense of space by allowing for a clear line of site beneath the vanity. A more custom look. Free-standing bathroom components can mimic the look of furniture — or even be fashioned from actual furniture. Match the rest of the home’s style by picking one that suits your taste. Cheaper costs. Despite being fully finished furniture, free-standing vanities are actually more economical than built-in options. They’re typically prefabricated and portable, so you can take them with you, even if you move. Versatility. Free-standing vanities come in all kinds of sizes, colors and designs. Whether you go with a small, white cabinet or a large vanity that looks like solid wood, you can easily find an option that suits your taste. When you’re looking to give a bathroom a fresh breath of style and storage, consider free-standing cabinetry. Turn off the water. First things first. Using pipes and wrenches, turn off the water supply to minimize water spraying everywhere when you install your new vanity. You may have a shutoff valve beneath the sink, but if you can’t figure that out, you can alternatively just shut off the entire house’s water supply. Remove the old vanity. In the case of a bathroom remodel, you’ll need to remove the old vanity before installing your new one. You might have to do this in sections, particularly if the vanity is large, if it has a tile backsplash, etc. Think about whether or not you want to preserve the old vanity — to re-use or sell it, for example — or whether you’re just going to throw it away. If it’s going to be discarded, you can feel a little freer to be rough with it as you get it removed. Prep the area. Once the old vanity is gone, examine the walls and flooring left behind. Is anything damaged or unfinished? If so, take the time to patch walls and/or paint as needed. Prep the vanity. There are a few things you’ll want to keep in mind when you’re installing your new vanity: Does it have a back? If so, you’ll need to cut out spaces for pipes. Is it level on the floor? If not, you’ll need to shimmy the legs so that everything sits securely. Mark the installation location. Use measuring tape and a pencil to mark the location of your new vanity on the wall, so you’ll know where to install it. Install the vanity. To install your vanity, set it in its new location and attach it to the wall studs using the right screw length for the vanity (to avoid hitting pipes, you won’t want to use screws that are longer than 1 inch). Put in the new vanity top. Your next step is to add the top of your new vanity. Start by putting 3/8 inch of silicone caulk around the top of your base where the vanity top is going to sit, as well as along the wall if your top is going to border the wall on either side. Put in the sink and faucets. Install your new faucets and sink, and drain the assembly on the sink top. Your faucet will likely come with installation instructions to aid you in this step. Connect the plumbing. Because this step is a little trickier, you may wish to call in professional help. 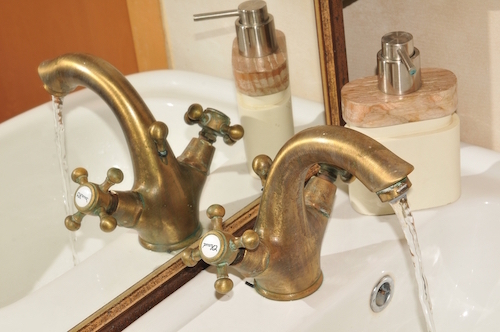 Whoever reconnects the plumbing, however, it’s important to get it properly hooked up in order to have water running to and from your sink(s). Caulk the backsplash. If your vanity has a backsplash, be sure to caulk where the wall and the backsplash meet, and use your finger to smooth the joint. Once your vanity is installed, you are free to enjoy a renovated, stylish bathroom space that you did yourself! With a free-standing vanity, you can revolutionize the look of your bath. When you’re on the hunt for quality bathroom vanities that won’t break the bank, look no further than Modern Bathroom. We provide factory-direct pricing, free shipping and a huge selection of products from top brands. Not only are our prices typically 70 percent lower than what you’ll find elsewhere, but we also offer a low-price guarantee. That means, if you find a lower rate (including shipping) elsewhere within 30 days, we’ll refund 110 percent of the difference. Shop our selection to find ideas that appeal to you, or, if you’re in California, visit any of our three showrooms to see products in person. For the best bathroom products at the most competitive pricing, come to Modern Bathroom. Shop our website today! When you’re designing a new bathroom, every detail matters — from the color you paint the walls to the bathroom vanities you purchase. In fact, because a modern bathroom vanity is one of the most noticeable components of a bath, it’s often one of the toughest shopping decisions to make. What kind of vanity is right for your bathroom? Should you go with a traditional style or a modern vanity? Do you want something minimal or ornate? To help you think through options for style, color, shape and so on, here’s a look at a few tips to keep in mind when you’re shopping bathroom vanities. Trying to match your various fixtures to your vanity can be tricky — so one way around this is to choose vanity sets. Vanity sets help you simplify your decisions by letting you pick matching pieces like mirrors, lights, cabinets and faucets. Instead of having to find individual pieces, you can pick a full set at once. Sets help you get a cohesive look, while also simplifying the shopping process. In a market with such diverse possibilities, it only makes sense to shop around for vanities at a good price, no matter what your budget. That’s because you want to find the best value for your money. With this in mind, Modern Bathroom is pleased to offer factory-direct discounts that save you up to 70 percent of retail costs. We provide free shipping and offer a low-price guarantee that means we’ll refund 110 percent of the difference if you find a lower price, including shipping, within 30 days of your purchase. While a powder room typically does best with a small vanity, there are a lot of perks to incorporating a double vanity in a larger bath. In other words, size matters when it comes to vanity selection, and so does scale. When you’re evaluating vanity options, it’s vital to look at the size of your bathroom and know what it can accommodate. Understanding what you have to work with will help you eliminate options that won’t fit or aren’t right for your room. Think about the differences between a main bathroom vanity and a vanity in the powder room off the kitchen — while both need to house a sink, one will need to be large enough to hold toiletries, towels, appliances, etc., and one might not need to store anything. Do you need counter space to accommodate a morning routine? Do you need minimal space to make a small bathroom feel bigger? By choosing a vanity that addresses your goals, you make a smarter choice for your bathroom design. Today’s vanities come in all kinds of styles and materials, from wood veneers to granite. Ideally, you want to pick an option that can withstand regular humidity and use. Your vanity will probably often be wet, covered with toiletries, and/or exposed to shower steam. Some good options are laminates, wood veneers, thermofoil, and wood that is properly sealed and lacquered. The bathroom vanity is where you wash up at the end of the day, get ready in the morning, primp, fix your hair, apply makeup, shave and more — that’s why lighting matters. You want to be able to clearly see what you’re doing in a well-lit space. In most cases, you’ll want to go with sconce lighting that flanks the mirror, providing indirect but proper lighting in the bathroom. In a small bathroom, plan for at least two sconces; in a larger bath, shoot for three or four. If you want to save yourself the headaches of constantly cleaning your vanity, look for easy-to-clean surfaces. Choose a durable, low-maintenance vanity top and avoid anything with grout that’s notoriously tough to keep up with cleaning. Last but not least, you want a vanity that works with your overall bathroom color scheme. Are you going deep and dark or bright and white? Will your walls be a soothing neutral, and you want a light-colored vanity top to match? Is your style defined by certain color schemes that can guide your vanity selection? While decorating is only one part of a bathroom design, it is one part worth considering. Make sure the vanity you select works with your overall decorating goals. Whether you’re remodeling an existing bath or thinking through options for a bath in a new home, shopping among the sea of possibilities is challenging. When it comes to choosing the right modern bathroom vanity, you have a lot to think about — from color scheme to materials to size. To help ensure you make the right selection for your needs, think through the factors above. By properly evaluating the possibilities for your bathroom, you can make an informed decision you’ll enjoy for years to come. When you want to add a little luxury to your home life, don’t overlook the bathroom. Ordinarily a utilitarian space, the bathroom becomes as enjoyable as a private spa with the right combination of purpose and effort. So just how do you achieve a spa-like feel at home? What are the secrets to bathroom luxury? To help you think about how to experience tranquility and pleasure through a home bathroom upgrade, here are some tips. From making over bathroom vanities to selecting your choice of bathtubs, here are some of the best ways to increase the luxuriousness of your bathroom. The colors you use in your bathroom have the potential to dramatically change its overall feel. For the most soothing, relaxing effect, opt for calming neutrals such as whites, creams, grays and other natural hues. Spa-like tranquility is all about embracing the best parts of nature, and that includes natural light. Let the light in and keep it flowing by incorporating uncovered windows, glass shower doors and even skylights or floor-to-ceiling windows if possible. The more sunlight that streams into your bathroom, the more open and inviting it becomes. Whether you’re talking about the toiletries you keep on your bathroom countertops or the products tucked away in the vanity, do yourself a favor and declutter the bathroom. The less unnecessary junk you have sitting out and in your cabinets, the cleaner and more relaxing your bathroom will feel. From copper fixtures to crystal chandeliers, you can create a luxurious feel in the bathroom by using luxurious features that hint at elegance and style. Explore the possibilities when you look at bathroom sinks and bathroom vanities, considering the kind of style each component could present. From wood floors to stone counters, try to use natural elements that create a stunning, calming effect in the bath. For a fluid bathroom feel, try using minimalist bathroom elements such as a wall-mounted vanity that “floats” off the floor, and frosted glass partitions to divide the shower from the rest of the room. From granite counters on bathroom vanities to marble tile on the walls, using high-end finishes emphasizes the luxurious feel of a high-end spa. Twin bathroom sinks mean twin places to get ready in the morning or wash up for bed at night. This increases the usability of the bathroom. Using a vanity made from a former piece of furniture or a set of cabinets that look like they could go in the living room can be a fun way to add luxury while maximizing value. There’s just something about standalone bathtubs, especially when they feature claw-foot bases that hint at yesteryear. These beautiful bathroom features create classic elegance even while they invite long, leisurely soaks. Add one to add a sense of laid-back luxury to your bathroom. Set apart the shower by making it bigger than the standard shower size. With a two-person shower, you create a larger, more spacious place to clean up each day, mimicking the spacious feel of a spa setting. Nothing says “relaxation” like a fireplace beside the tub. If you can swing it in your design, consider adding a bathroom fireplace that can flicker and warm the room while you unwind each night. Tucking the toilet away in its own room increases privacy and the bathroom’s usability. Wallpaper’s not what it used to be. Today’s modern styles include bold, colorful, eye-catching options that can make a major statement in the bathroom. Nothing beats stepping out of the shower onto warm floors, especially in wintertime. Add radiant floor heat to take your bathroom’s luxury quotient up a notch. Step outside of a bath or shower to cozy, warm towels waiting for you when you have heated towel bars nearby. If there’s one thing you can count on in spa bathrooms, it’s living things adding to the décor and providing a natural vibe. Add a potted plant of greens, or regularly place fresh-cut stems in a vase on the counter. Skip the standard bath mats and go for elegant woven rugs that complement your bathroom design and add cozy textiles to the space. Increase the ways you can unwind by adding entertainment options to the bathroom space, and tuck them behind a mirror if you don’t want them always exposed. If your bathroom is large enough, add an upholstered chair where you can sit and relax to escape from the rigors of life. When you want to create a luxurious bathroom space, the key is to think purposefully about the elements you would like to incorporate. Whether you’re redesigning from the ground up or just looking to tweak an existing space, use the ideas above to create a more spa-like getaway in your bathroom.